To leave a group chat, go to your chat list and find the chat you want to leave. 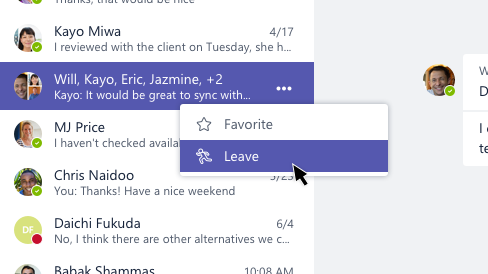 Click More options > Leave. Currently, there's no way to remove someone else from a group chat. You can always start a new conversation with a different group of people, though. To leave a group chat, tap the chat header and then tap Leave chat. To leave a group chat, go to the chat header and tap More options > Chat details > Leave chat.